It’s May of 1999, the heart of the dot-com boom. I walk into my first “professional” job as an information architect (what we would call User Experience today). I was an arrogant 22-year-old who had not only been creating websites since I was the age of 18, but had been paid well for it. From Photoshop to HTML to (limited) SQL, I knew how to do it all. And IA (information architecture) was only one slim facet of what I knew. As I sauntered through the overly-designed office of people pods, I was clearly the youngest person in this department — but there was no way anyone was more experienced in the Web. Several hours into my first day, as I’m sitting at my desk, one of the Lead IA’s strolls over to me and sets down a pile of printouts of about 200 wireframes. Every page is redlined with changes, some super simple and others that need to be thought through entirely. I’m told to work through the revisions and see what I can get done by the next morning. Three problems here: (1) I’d never seen a wireframe in my life; (2) I didn’t know how to use the software they were created in; (3) I’d never worked on a project this large and complex in my life. My four years of “experience” weren’t worth crap because this job and company required a whole different set of skills for me to do my job. Almost two decades later, I’ve been fortunate to collaborate with a range of User Experience (UX) designers creating and evolving a variety of successful digital products such as Hulu, Foursquare, the Wall Street Journal, and Rent the Runway. Each of these experiences not only required unique sets of knowledge — they forced me and my colleagues to wrap our heads around interactions and situations we’d never thought through before. About four and a half years ago, I met Sarah Doody when General Assembly (GA) asked us to create, design, and teach the first version of its User Experience Immersive Class, a 12-week program that promised an introduction to the world we’d both been working in for over a decade (more on that later). 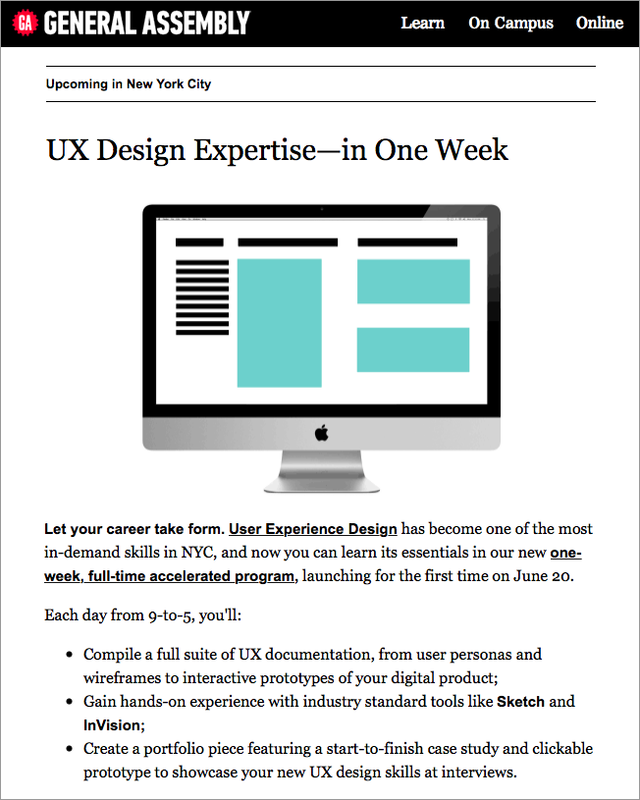 This course, to us, is that last straw in a recent string of programs offered by GA and other organizations touting to teach you the skills you need to be a UX professional in an accelerated period of time. The claims of these courses appear to be that once you’ve spent your time and, more importantly, gobs of money, you’ll be ready to showcase your UX portfolio and knowledge in interviews that you’ll quickly parlay into a job. Indeed, in this one week course alone, General Assembly claims that you will “compile a full suite of UX documentation” and “create a portfolio piece featuring a start-to-finish case study and clickable prototype to showcase your new UX design skills at interviews.” Promises like these define everything that is wrong with these courses and, furthermore, are a taint on the UX industry — or any industry that requires myriad skills and years of training. Not to mention that for us, this far into our careers, we are still learning everyday as new technologies, platforms, and habits emerge. Think about it — would you want a plumber who only has one week’s training? How about a psychologist? Or an architect? A high school teacher? Even the training to become a Starbucks barista takes more than a week. Returning to that first day of Dan’s career, the thinking he had to do to fix that product wasn’t mindless replacement of copy or a paint-by-number exercise. The work required understanding how technology worked and how people were actually using the internet. Remember, this was 1999 and the only platform prioritized was Windows (the Apple resurgence hadn’t quite happened yet), Netscape and Internet Explorer were the only browsers that mattered, and most people still used dial-up, making connectivity speed a factor. The internet was fairly new and most people’s habits were still forming, but there were some general tenets you could follow. To be perfectly honest, the experience Dan had designing for the web up to that point did in fact contribute to his ability to solve those problems, and ultimately qualified him to do that job. Jump ahead 17 years to today … there is a lot more to consider in design: platforms, devices, and audience habits (plus expectations, goals, etc.) have changed drastically. 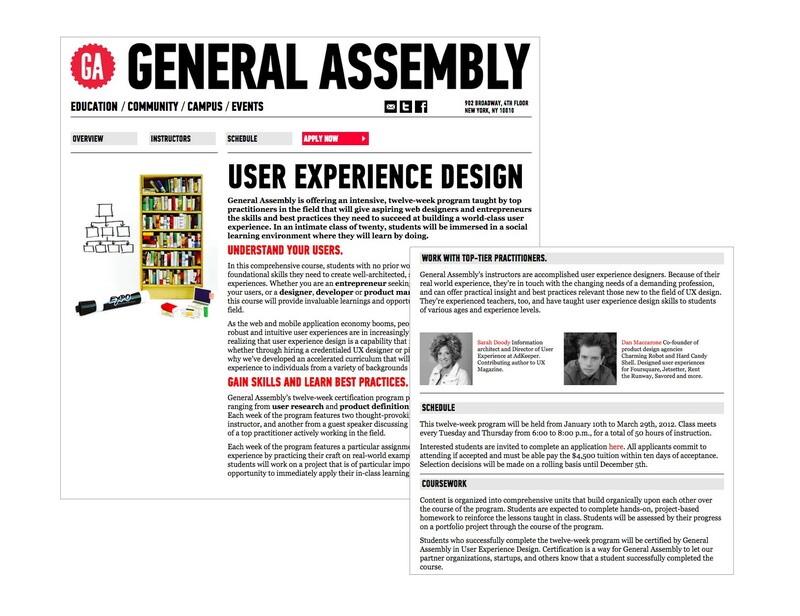 The original page on General Assembly’s site for the first 12-week UX Design intensive in January 2012. We set out to design a course that was meant to give our students an overview of what UX is all about, touching on topics as varied as the basics of user research, the range of deliverables, general principles to start with when solving problems, and what the various roles are in the world of UX (yeah, there are a few). We even wanted our students to get practical experience, so part of our 12-week goal was that our students could walk out of this course with a product in hand (or at least all of the UX done for one). We were ambitious. We were excited. And boy, were we wrong. User Experience design matters and more and more people and companies are taking note. AirBnb, Warby Parker, and Uber are all companies that made a conscious effort to focus on design and as a result, created great experiences that their customers love. It’s clear that experience design plays a critical role in attracting audience, building trust, and getting users to take action. Because of this, it’s not surprising that there is increased demand for User Experience designers today. Companies realize the return on investment when they hire good designers. As the perceived definition of design has matured from “make it pretty” to “make a great experience,” the skillset of the designer has also matured. However, the ecosystem of how to learn about UX is unfortunately more confusing than ever. If you do a Google search for “UX courses” you’ll be flooded with a wide range of options to match any budget and schedule. For example, Udemy has a two-to-three week course for $40, General Assembly has a 10-week part-time course for $4,000, and Center Centre has a 24-month program for $59,980. The School of Visual Arts in New York City offers three types of education programs on interaction design alone, ranging from workshops to a Master’s degree. And that’s only a very small sample of the diversity of courses available today. Many courses offer certification, often after as little as one week. In our careers, never once in an interview did someone ask if we had UX certification. Similarly, never once in the process of hiring someone did we ever look to see if they had UX certification. To be frank, we’d have to do a Google search to actually know what certifications are even out there. Would someone with a degree in interaction design or human factors stand out? Of course. But at the same time, a certificate doesn’t equal competence. A certificate doesn’t mean you can do “it” in the real world. A certificate just means you showed up and are a good test taker — if there was even a test at all! We often ask ourselves, if we had to take the certification exam, would we pass it? Maybe not. Because User Experience design is so subjective — there are no true rights or wrongs for the most part — working through problems may have the same process but there could be ten different answers. One of Sarah’s first bosses gave her some great advice: know your tool, know your tool as fast as you can, know your tool as well as you can. So that’s what she did. But then she realized she had to learn how to think like a designer in order to use the software to create smart, thoughtful designs. A great designer doesn’t just create a deliverable. Creating truly successful products starts with understanding people — and not just the people you’re designing for (though that’s critical as well). Often the User Experience designer is sitting in center of the conversation, navigating the challenges faced by business requirements, conflicting users needs, technical limitations, and design opportunities. Marrying all of these into a single product means gaining as much of an understanding of all sides as possible, and then communicating effectively, fairly, and clearly to all team members. And that is before the pen ever hits the paper. As an individual, you need the confidence to back up your ideas or to push back on ones you think don’t fit the product thesis. You need to learn how to listen to great ideas from all sides, build the talent of persuasive communication, and, ultimately, understand when you’re wrong and why. Experience design is, at its crux, an experiment in collaboration. To be a great designer, you have to master the soft skills. A huge part of the job will involve stepping away from the design software of choice and dealing with people. Designers must be master communicators, possessing the confidence necessary to have the tough conversations. And they will happen. Designers need to know how to deal with stubborn stakeholders, tell people they are wrong and why, admit when they’re wrong, and master the art of explaining their design decisions. Designers must also learn the art of collaboration. Working with people in many different business roles means they have to quickly be able to understand others’ perspectives, what matters to them, and how they can contribute to the UX process. Also of importance is the ability to collaborate with other designers, which involves being able to quickly recognize each other’s strengths — and assign responsibilities accordingly. The great debate concerning whether or not designers should learn how to code isn’t going away. We firmly believe that designers do not need to know how to code and that it’s more important to be literate in the wide variety of other skills we mention in this article. However, this doesn’t mean that designers should ignore technology — and if the want to take the time to learn the ins and outs of code, it certainly can’t hurt. To design effectively and collaborate with developers, designers must be technically literate. Designers should have a basic knowledge of HTML and CSS so that they understand how their design will ultimately get built. Technical literacy is similarly valuable when it comes to troubleshooting. Not all designers will get to see their design through the product development lifecycle, but these skills are useful for designers who find themselves helping with quality assurance. Technologies are changing faster than ever before. New platforms and devices mean that our medium is always shifting. 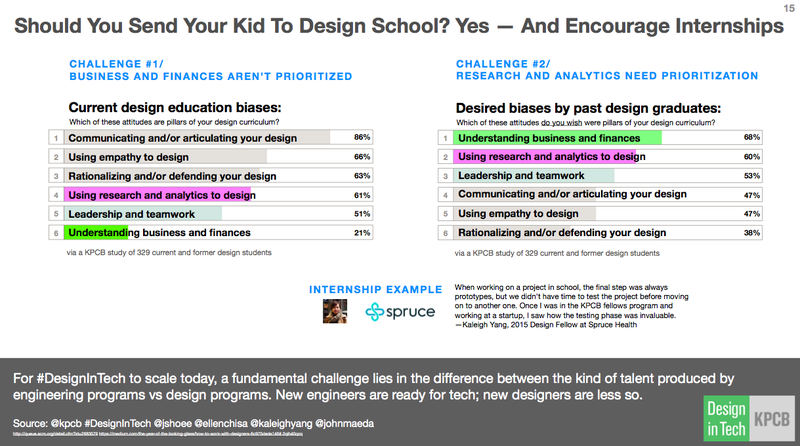 In order to stay current, designers must commit to lifelong learning. Technologies change and user habits change (and go away). This constant state of innovation means that we always have to be re-thinking what we know. We cannot simply rely on old knowledge, templates, patterns, and habits. We must always ask ourselves why we’re doing things a certain way. We must always challenge each other to justify our design decisions so that we don’t fall prey to being too comfortable and complacent. At its core, a User Experience professional is a storyteller. Every project involves looking at the paths a variety of users will follow in order to achieve their goals with the product we are creating. Often, we find that examining the process of other storytelling professions can give us insight as to how to be better organizers of information. And, often, people with experience in these other disciplines make great UXers, particularly those from the worlds of film, theater, journalism, psychology, architecture, and library science. Where do we go from here? It’s easy to try and make General Assembly and its peer companies scapegoats, but that’s not productive or solution-oriented. GA isn’t the problem. It’s the symptom. The problem is that the UX industry is misunderstood. For wonderful reasons, we cannot be defined as one thing and there’s no one true path to success. We’ve been fighting for almost 20 years now to just gain the recognition that our role in the creation of a product not only matters — it is critical. And now we’re at a place where it’s trendy to be in User Experience. That’s a huge victory for the profession, but we need to fight to not let it be cheapened by thinking just anyone can do it. Just like not everyone is fit to be a doctor or a carpenter or an astronaut. As designers, we are problem solvers. So let’s solve this problem together. What can we as a design community do to fix the broken way that people currently learn how to become great at UX? Dan Maccarone is the co-founder of Charming Robot, a digital product design agency in NYC. He also hosts the podcast Story in a Bottle, chronicling the stories of tech and media professionals. Follow him on Twitter @danmaccarone. Sarah Doody is a User Experience Designer in NYC. She teaches people how to think like a designer through her weekly UX newsletter, UX courses, and her YouTube channel. Follow her on Twitter @sarahdoody. Co-founder of digital product design shops Charming Robot & Hard Candy Shell. Host of the podcast Story in a Bottle. Sometimes bar owner.